News outlets are reporting that a large inbounds avalanche occurred at Taos Ski Valley on Thursday, January 17, 2019. Reportedly there were two confirmed skier burials and it is unknown at this time of others were caught by the large slide. Ski patrollers were reportedly able to rescue two skiers and evacuate them to medical care. There is little currently known of their condition. Searchers and avalanche dogs continue to probe the slide debris in an effort to rule out additional burials. 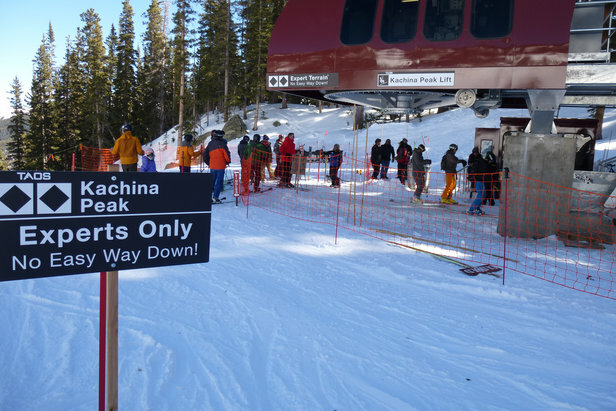 The avalanche occurred in the Kachina Peak area of the resort. The area of the resort had apparently just recently opened for the season and patrol had conducted avalanche mitigation work in the area. Taos installed a lift into the Kachina Peak area in 2014. Before the lift was installed, skiers had to hike to the side-country inbounds terrain. Tragedies like this serve as a sober reminder that avalanches can and do take lives within ski area boundaries. It also raises questions about the efficacy of avalanche mitigation efforts in light of opening steep avalanche prone terrain. We can only hope that no others were buried by this slide. My heart goes out to all touched by this horrifying incident.